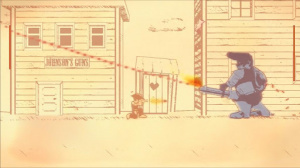 When Gunman Clive was announced for the 3DS eShop, some smartphone gamers may have had their heads turned; one of the few complaints of the original release was controlling the gun-slinging hero with a virtual joystick and buttons. Here was an indie-game with a smart visual style and loving references to some of the classic platforming tropes, and it was now arriving on a dedicated gaming system. That potential is fulfilled, we're pleased to say, with the simple additions of buttons and stereoscopic 3D enhancing the experience. 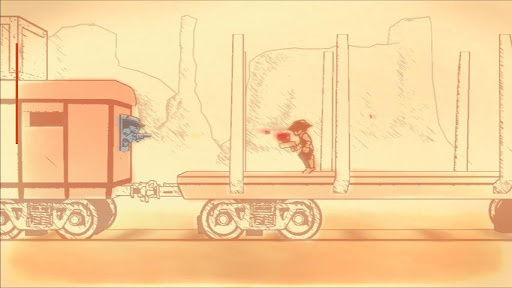 The most striking thing about Gunman Clive, initially, is the audio and visual presentation. The visuals utilise a clever paper effect, with the background having a grubby, aged look that deceives your eyes into thinking your screen needs a good clean. It's an interesting approach, and even caused our eyes to tingle for a few minutes as they adjusted, but after that initial period the depth on offer was a pleasure to see. Animations are smooth and supported by a fluid framerate, while catchy music and retro pew-pew noises for your gun are likely to draw a smile. With just two names listed in the credits, it's a testament to talent and a solid concept overcoming the odds. As an action platformer this title perhaps draws inspiration from revered series such as Mega Man and Super Mario Bros., though the conventions are so common that swinging and moveable platforms aren't exclusive to those franchises. What starts in early stages as a fairly standard but well-crafted platformer diversifies in unexpected ways, with shifts in enemy types and platforming requirements that are a delight to tackle. We're not going to reveal too much, as the surprises are well-paced and a treat to work through, but the 20 stages on offer provide plenty of variety in the experience. When you throw in a few different gun power-ups as well, there's a limited but satisfying set of skills and challenges to put you to the test. There are three save profiles on offer, and for those sick of the stereotype of the heroic man rescuing the damsel in distress, you can play as either Clive or Ms. Johnson; the lady can rescue the gent in distress if you so please. They play slightly differently, with Clive being a little quicker but Ms. Johnson having the ability to float and slow a jump's descent, so both have strengths worth trying out. There's an unlockable character that's worth discovering for its own quirks, too, while three difficulty levels merely change the amount of health available, with Hard being reserved for particularly skilful gamers. The controls are tight, the levels are well structured and the variations in challenges — including boss fights — are fantastic. The only downside is that the stages are also very short — typically one or two minutes each — and we'd beaten the game in normal difficulty in around 40 minutes. This can be countered by the fact that there are multiple characters and difficulties to play through, and it's enough fun that you may revisit it just for the sake of having a good time. Its budget price-point also helps, but when something is this short and sweet we can't help but wish there was more. 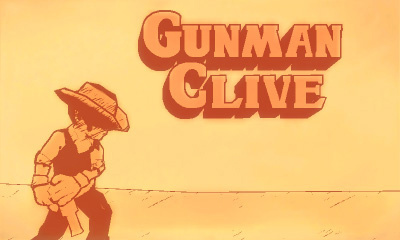 Gunman Clive offers terrific run and gun action at a steady tempo, with distinctive and gorgeous audio and visual presentation. It borrows memorable elements from classic franchises, but has its own physics and mechanics to go with its unique sense of style. With such a small development team — of two — it's remarkably polished and comes at a budget price, and our only complaint is that it's over all too soon. Such is the enjoyment on offer, however, we suspect a number of gamers will happily replay the short stages over and over, and we expect Mega Man-style perfect runs to become a YouTube fixture in the future. Sounds good. Hope it comes to America. Ducks and rabbits cause damage. Easter must be terrifying in Clive's World! Good review and have to agree. For me overall a great game for the AUD$2.50 for it. Matching atmospheric music and 3D were very nice. A certain underground level had me over the moon. Hope they give us more. I like it as DL ware. Good revw. I agree with the review, I don't think I'll ever complete the game on hard with the hidden character! I already have it on my Xperia Play with button controls, so I'm good here..
the hidden character begins with a "D"
on my second playthrough now. I originally completely ignored this, assuming it'd be a piece of crap, but I may have to download it now. Wouldn't have even looked at this if not for the review. Thanks Thomas as I'll be picking this up the first chance I get. After all who can beat that price. 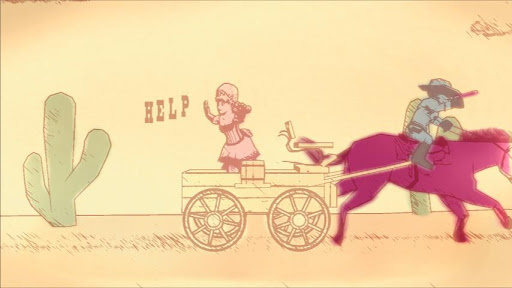 I love the visual style and animation. Looks like good (and I don't care if its short) fun! I hope this comes to NA. It looks like a lot of fun. Hmmm... Remember Sunset Rider! Looks like good.... Great review! It's an awesome game. I love all the things the copied from Mega Man, Donkey Kong Country and Super Mario. It's a great game with awesome visuals, great audio and tight controls. Great review Thomas. I absolutely love this one. Does anyone know if this has the same amount of levels as the IOS version ? @X-Factor Pretty sure its the 3rd of January not tomorrow. I already was very interested in seeing the trailer, but now that this review just praises it and it has that £1.99 price tag, I'm definitely gonna pick this one up. Out of curiosity, I know this game awards you with NO DAMAGE badges when you finish a level without getting hit, but are there other things as well? Like a SPEEDRUN badge or PACIFIST badge or anything? I haven't seen them, but if I know they exist I'll be glad to earn them. I still revisit Super Mario Land as it's great fun, even if a playthrough takes a half hour! Will be sure to check this 'un out. Thanks for the review. It sounded like a 9, but I don't care. It may be a wise purchase, and I love that you get different playable characters that are more than a reskin. Anyway, if I have extra eShop funds when I download PM:SS (the only reason why I'm downloading is because of the free Donkey Kong game), I might get this. I'm sure it's better with actual buttons and whatnot, but if it's anything like the mobile version I'll pass. I got it as a free-app-of-the-day on my Kindle Fire and was not impressed. But to each their own! Great review, an 8 is spot on. I've played through it twice, it is a breeze to finish but is fun enough that I am sure to play through it again and again to beat previous play throughs. It is a lot of fun and a decent challenge, the only thing I didn't like so much was the slow floaty movements. It was clearly made for IOS in that sense and lacked the silky smoove movement of a Megaman or Mario. To those people on the fence I say get it, it is so cheap. $1.99 makes it an instant buy. Any idea on DLC? Personally I hope they Start 3d'izing a bunch of iOS and Android games. There are a Ton of Great games for those platforms. I loved Gunman Clive on my Android Tablet and i'm sure I will love it on my 3ds with the more than cool sidescrolling 3D. Rovio should have stuck to the Formula they use in the Markets Rather than hitting people with a 29.99 Angry Birds. I haven't seen sales figures on that But I bet its not good. Heck even converting Titles like Dungeon Village to DSiWare would be the greatest! @Windy Even better than porting Android games to 3DS — get these teams making original games specifically for the eShop! Mr. Horberg, we will support you. Excited for Clive's release in the states. Originally, I wasn't planning on getting this but after this review, I think I will. Great review! Very impressive art, its a steal for around €3. 2 dollars, what I saw as a piece of crap I might buy now. @rayword45 is that 170,000 copies sold for 3DS? That surprises me. Normal mode have a glitch screen freezing..its really annoying. Positive feedback from people I know prompted me to download this, and I'm glad I did. It's pretty easy once you get the physics down, but it's simply a fun game to run through and it's a definite purchase for any speedrunners out there. This game gets released today in NA!!! Looks pretty cool. this game is just fantastic. can't believe it's only $2. if you own a 3ds I highly recommend it. This game completely slipped under my radar, for some reason. I'm definitely going to get it. Great game. Bought it 2 days ago and I'm having tons of fun with it. With this price tag it is no-brainer! When I go out to a party, i pay 2,50€ for a beer. And this small thing of masterpiece costs 1,99€... Ridiculous times. @kyuubikid213 Hey! Another Egoraptor fan! Woohoo! Great game, Just excellent! Great musics, great graphic style. Very short but a great game despite that. Now, we want Gunman Clive 2! Ok glad I bought this gem of a game!! WOW, JUST WOW, just downloaded it and I'm glad I spent 2 bucks on it, it really is an underground gem; to everybody like me that just read the review, do yourself a favor and give this a try. I applaud the simple approach the developer took with this game. NO COMPLEX THINGS THAT RUIN IT, just mario/megaman/contra/sunset riders controls: the control pad, a button to shoot and a button to jump, THAT´S IT. Oh by the way, the bosses are also fantastic (something my all time favorite eshop game mutant mudds sadly lacked....). Some of the coolest graphics ever. If this was 1st party, I wish it would be a smash bros stage. I can't help but feel rather disappointed by the game. Clive moves terribly slow (now that I've read that he's actually even the faster character, I'm not sure I wanna try the lady one), the bosses are either boringly easy or borderline frustrating (the train), weapon powerups are nearly impossible to differentiate before picking them up, and some later stages don't feel well-designed. There are lots of neat little throwbacks to other games, but when asteroids rain down from above without any indication as to where they will actually come down, all while you are required to hop over large gaps in low gravity, cleverness ends right there, and annoyance kicks in. Don't get me wrong: It's still a neat (and beautiful) game, but nowhere near a masterpiece. I'd give it a 6 or maybe a 7 at most. @Windy I think you might be a fellow psychic (although my visions of the future only come in my dreams; I remember dreaming about the Wii U 2 years before it was announced and it turned out to be EXACTLY like my dream)! Bought this game simply because I had a little bit of cash left on my eShop account and didn't know how to spend it. For a game costing $2 there's no reason not to try it. There really should be more games in the wild west.